As a continuation of our “Three Cs” hop profile series, this post is an examination of Columbus hops. As I dug into the history of this variety, I uncovered a saga of multiple identities and lawsuits. Origin: It was bred in the USA by HopUnion. The year it was cultivated and made available to the public is hazy, but I am guessing early 1990s on the availability. Now, this variety also goes by the name of Tomahawk, which is a copyright of Yakima Chief, Inc. Based on the details of a lawsuit that was filed against Charles E. Zimmerman, it seems that Yakima Chief received this variety through Mr. Zimmerman and rebranded it. Columbus hops are now patented and owned by a joint venture between Mr. Zimmerman and HopUnion. They mended their relationship and YC still gets to sell Tomahawk hops. 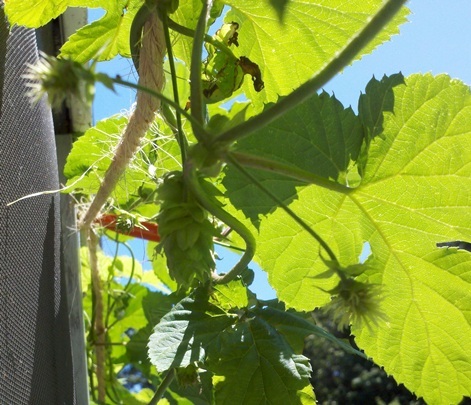 The Zeus hop variety is said to be similar if not identical to Columbus/Tomahawk. It is owned and branded by Hopsteiner. Aroma: Earthy, spicy, pungent, with some citrus overtones. Not overwhelmingly citrus like Cascade. Strong herbal. Typical Usage: Again, another dual purpose hop. Many sources saying it was a good candidate for a single hopped beer. My opinion on Columbus hops is that they should be used as a bittering hop. They have a good American hop profile and a bit more pungent than other Pacific Northwest hops. Try bittering with Columbus in your next APA and try using a new flavor hop like Citra or Nelson Sauvin for the aroma hops. I think these would blend well with these newer flavor varieties but still give you the kick you are looking for in a bittering hop variety. I still have a bunch of Columbus in the freezer. Great bittering hop, although I’ve never used it for flavor or aroma. I brewed an IPA using columbus as a single hop with lots of late hop addition in fact 8 ounces for 5 gallons. OMG what a great IPA ! A Columbus hop IPA sounds delicious. Excellent suggestion for using Columbus as a bittering hop and Citra for aroma…absolutely delicious!! Also, don’t forget Chinook as a “C” hop, it makes a smackdown great IPA as well! !